At just 15 seasons, Prince Ronan Latimer emerges from the Tournament of Knights as its youngest champion in five hundred years. A champion who's earned the right to absorb ancient Meranthian battle magic. Battle magic that places him among the ranks of an elite group of men and women dedicated to preserving Meranthian culture and upholding its law. But what should be a time of celebration ends in horror as Ronan's mother, Queen Arianne, falls victim to an assassination plot. With his life turned inside out, Ronan's thirst for revenge threatens to destroy the life of his only friend and leave the kingdom in shambles. Ronan races to unravel the key to an ancient mystery meant to restore the full power of magic before his enemies. The first part of an epic journey awash in magic, adventure, and romance travels through sprawling cities, giant forests, dangerous snow-capped mountains, and long-forgotten underground ruins. What did you love best about Shard Knight? I enjoyed the fight scenes. I was, for the most part, able to have a movie of the action running in my head. The writer paints vivid pictures with words. Would you recommend Shard Knight to your friends? Why or why not? Yes, It is a beautifully told story. Matthew Ballard has created a wonderful world and a wonderful story. It is also a story that will carry through future books. The characters are the sort you felt like you could get to know. My issue with the book is that he rushed through some areas that could have used a little more time. Also there were jarring Time/Plot hops. At first I honestly thought there was something technically wrong with the download. This is what I mean when I say he needs to spend a little more time. Transitions are abrupt and rough. I see this as something that can be fixed. He also needs to work on the dialogue transitions. "He said, She said" are great tools but there are others as well. A little diversity will help a lot. I will buy more books by this author. I truly enjoyed the story and the world created and I look forward to future adventures. I enjoyed his voices and accents the most. They carried me away and I was able to forget about the narrator. He helped wrap the listener into the story. There have been narrators who's voices to not mix well with the story. I end up thinking more about the person talking at me than the story. Being able to forget about the narrator as a person and have them be a storyteller is important to me. The narrator, Greg Tremblay, has become one of my Top 5 Narrators on Audible. He brought the book to life. I was able to forget that the narrator was male. He became gender-less. His interpretation of some of the voices was a surprise when first used but quickly became a tone that worked for the characters. The flow of accent was smooth and made for some lovely listening. I look forward to listening to more of his narrations. I do a lot of driving. The story kept me interested and the narration helped fuel my imagination. It made the hours go by more easily. To be frank, if it wasn't for the fact that there's a 5 year gap from the assassination to when Ronan makes his play I might have enjoyed this book. But 5 years! The story doesn't make sense with that and it rubbed me raw the entire book. It's also just too much. It's a two book story smashed into 1 book. All the pieces are there and I couldn't put the book down at times, but at the end of the day it wasn't the worlds best story. It was also very predictable and a less than satisfying end. Is it worth a credit, yes. But don't pay any more for this. Greg doors a great job! great story. Great story. I'm really looking forward to the next book! I hope Greg Trimbly read that one too! The characters didn't seem to learn from their mistakes. Also, there was not enough depth to the main villains character and actions. A slow start but worth the wait. I actually stopped listening to this book after the first few chapters and had planned to return it. After I started and finished another book I decided to go back to this and I'm glad I did. The book kept gaining momentum as it went on and I enjoyed the rest of it. As this characters development and plot gained that momentum I had a difficult time taking breaks. I wasn't thrilled with the narrator and he was one of the biggest reasons that I stopped listening to it in the first place. Sadly, the cover art is really all you need to know about this book. First. Characters are two dimensional and paper thin. It's the fantasy market, so absolute good and evil are sort of accepted. But good authors in any genre find ways to give some flaws to the heroes and reveal at least a little conflict in the villain. All is very black and white and stereotype here, folks. Ugh. Next, I'm guessing this is aimed directly at young teens who are overwrought with the changing body drama. Even the most mundane of events warrant a 'blast of heat' flooding one's face, rippling or cringing or throbbing muscles, hard goose flesh rising on skin, and all but debilitating lurching, flopping and rolling of stomachs. The history/expository sections were a welcome relief; every few hundred words of narration brought another pointless bucket load of bodily reactions. Finally, Mr. Ballard makes frequent visits to the Department of Redundancy Department. How many times can you type 'spirit magic' in one sentence and not get your spirit fingers magically slammed by your laptop screen? Hearing all about the thick book with the dark, thick layer of thick dust made me want to punch someone in their thick head. To his credit, Greg Tremblay did a remarkably good job with what he was given. There was some confusion for me with the Ayralen voices - some were sort of Spanish or Italian, others were entirely French - so I couldn't settle all the way into a comfortable profile for them. Whether natural or good editing skills, he does a terrific job of switching from narrator mode to a very broad range of character voices. As good as he is, it's not enough to carry the book. I'm hoping Ballard either finds a credible editor, or that his writing matures faster than his main character seems to be (which is not at all). Otherwise, I'm not going to make it through the series. This story is very fast paced. There isn't a lot of world building and there isn't much information given on the magic system. The latter of which made it difficult for me to suspend disbelief. The story is pretty cookie cutter too. I kept finding myself distracted and would have to skip back a few to several minutes to figure out what was going on. I won't be purchasing anymore in this series and don't recommend it. The narrator was much better than average. I'll be looking out for more books he narrates. This was a pretty forgettably generic bit of fantasy. It wasn't bad, but I've heard this story before by other authors, and with different titles, and, frankly, it was told better by them. It's not a bad book, but if you're looking for something new or original, look somewhere else. Also, the narrator was a little weird. I have a Kindle Fire, and it has a text to speech function where it will read books to you. It's not perfect. Most of the time you can tell that it's not an actual human being reading to you. It's flat and emotionless, and speaks with a mechanical cadence, rather than in a natural rhythm like an actual person would. At times in this book, the narrator sounded like that flat, mechanical voice from my kindle. It was pretty off-putting. 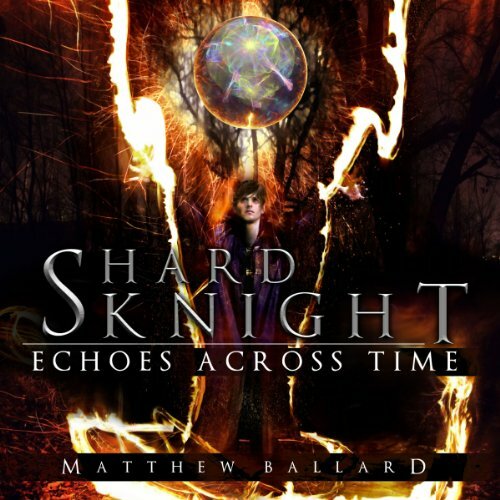 What made the experience of listening to Shard Knight the most enjoyable? I listened to this book while running. The diverse voices of the narrator made me feel like I was there. It was a wonderful distraction from pounding the pavement. It's fast paced enough to stay interesting, but not so complicated that I couldn't focus on the road. I also appreciate the number of characters (each with a unique voice!). Enough to make the story full of twists, but I didn't feel the need to have the names/locations printed in front of me to go back and reference. The cast of women play essential roles with grace. I noted the strength of the females in this book and enjoyed it! When Ronan gets the support of the crowd in battle. When Ronan's mentor didn't make it on to the bird. Reminiscent of Terry Brooks, well written/acted! Would you listen to Shard Knight again? Why? I would definitely listen to this story again. It is a great memorable fantasy tale with a coming of age story thrown in for good measure. It reminds me of some of Terry Brooks' tales, like the gypsy morph series. What was one of the most memorable moments of Shard Knight? The secret entrance underneath the tavern section was particularly exciting and well written. The voice actor did a particularly good job in giving each character depth and distinct voices. I thought the choice of accents for Ronin and Reika's people were spot on. One drawback to "reading" with audible...I have no idea how to spell anything!